NEW YORK (CNS) — St. John Paul II “looked at the world with Mary’s eyes and saw man in need of mercy,” the postulator of the pope’s canonization cause told Massgoers Oct. 12 at St. Vincent Ferrer Church in New York. “Mary’s eyes are the eyes of a mother. Her gaze embraces us and reads what is in our hearts,” said Msgr. Slawomir Oder, who was the homilist at a special vigil Mass to mark the 100th anniversary of the last Marian apparition at Fatima, Portugal. Mary appeared to three shepherd children at Fatima in 1917. She first appeared May 13, and the apparitions continued once a month until Oct. 13. “Mary looks at us with a mother’s tenderness and she is able to reach our hearts to see our deepest needs,” Msgr. Oder said. “In her eyes, there is no judgment and condemnation. There is only maternal love. Msgr. Oder came from Rome for the vigil Mass Oct. 12. The principal celebrant was Archbishop Bernardito Auza, the Vatican’s permanent observer to the United Nations. After Mass, Dominican Fathers Gabriel Gillen and Thomas More Garrett held reliquaries containing relics of St. John Paul and of St. Jacinta Marto, one of the Fatima visionaries, for veneration by members of the congregation. St. Jacinta’s relic is a piece of a dress she was wearing during one of the apparitions and a bandage attached to her at her death. The St. John Paul relic is a blood-soaked portion of the sash he was wearing during the attempt on his life. Last May, on the 100th anniversary of the first Marian apparition at Fatima, a shrine was dedicated at St. Vincent Ferrer Church to the memory of St. John Paul. He credited Mary with saving his life after an assassination attempt in Rome on the feast of Our Lady of Fatima in 1981. In an interview with Catholic News Service in May, Father Garrett told Catholic News Service that the idea for the shrine came from the serendipitous offer of the swatch of the blood-stained sash St. John Paul wore the day he was struck by four bullets in St. Peter’s Square May 13, 1981. Msgr. 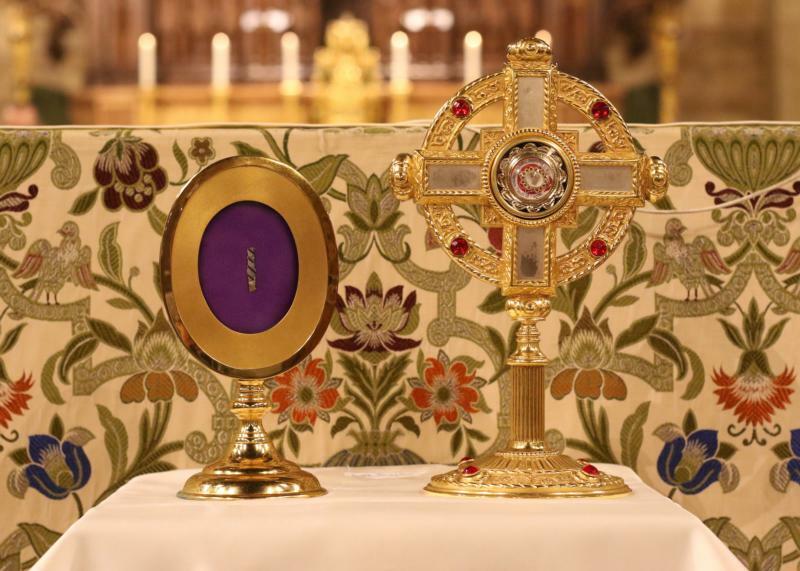 Oder said was “willing to part with a small piece of the cloth if we could find a fitting place for the relic to be venerated,” Father Garrett said. The priest is associate director of the St. John Paul II Society that was established in early 2017 in anticipation of receiving the relic and creating the shrine. The pastoral care of St. Vincent Ferrer is entrusted by the Archdiocese of New York to the Dominican order. “He was not one to just sit back and watch, but when, after the attempt against his life on May 13, 1981, he realized that his life was given to him for the second time, then and there he gave it completely to God through Mary,” the priest said. During the beatification process for the now-canonized pontiff, he recalled, the Marian aspect of the pope’s spirituality was brought up many times. “As one witness put it beautifully and eloquently, ‘John Paul II learned to look at the world with the eyes of Mary,'” Msgr. Oder said. “This is the dynamics of holiness! The saints were able to receive mercy in a particular historical reality, often marked by suffering, the experience of weakness and limitations. This openness to God’s mercy made them people of a new heart,” the priest said. He told the story of Sister Teresa from Myanmar, and how during one of the last papal audiences she attended, she was able to talk with St. John Paul. She was nervous and didn’t know what to say. “The only thing she could ask was, ‘Holy Father, what does it mean to be a saint? '” Msgr Oder recounted.